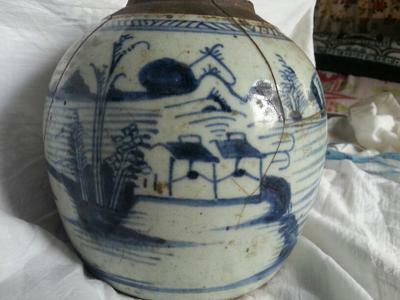 Blue and white porcelain vase 15cm high ,7cm across mouth,apparently used in a portugese church in india for ceremonies.Has a few cracks but no broken pieces shows a figure fishing ,ship ,sea ,land with trees ,huts and mountain and ?mark shaped like a 9 along the upper border.Could you kindly help identify the period and does the ?mark signify anything.thank you for your time. Don't get fixed about this "sign". There is no such character or mark in the Chinese language. This is just part of the painted decoration. It is just depicting the blazing sun. This is a ginger jar with missing lid. 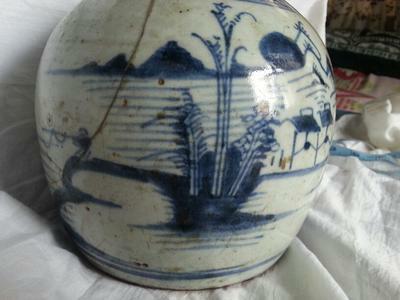 Would be from about mid-Qing dynasty. 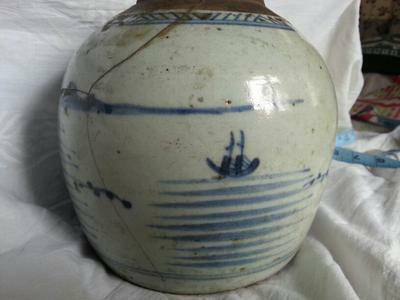 If there is a mark it is usually on the bottom, but most jars of this type have none. 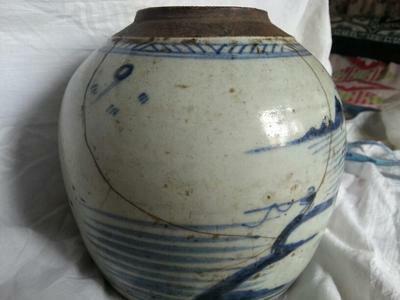 Marks are not added on the outside of such jars. Anything that may look like one is none, really.